On International Bacon Day, Baldsteve made a romantic breakfast for his sweetie before she went to work. With a Bacon toasting for two and some beautiful flowers, Baldsteve sets a great example for bacon lovebirds worldwide. 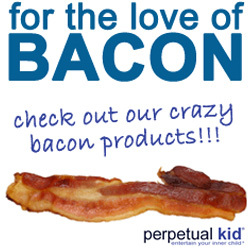 Happy Bacon Day! I suppose I could have given you a bigger heads up on this little known holiday but if you haven't figured it out yet, I'm a major procrastinator. Bacon Day is held on the Saturday before Labor Day and you can read more about it at International Bacon Day and BaconFreak. 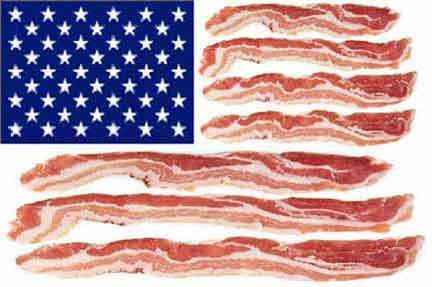 Personally, I don't need a holiday to tell me to eat more bacon, but bacon definitely deserves it's own day. With all of the attention these days to going green, bringing your own bags when you shop seems like a pretty easy thing to do. According to Worldwatch Institute, factories manufacture 4 to 5 trillion plastic bags per year. Even though many of these bags are recyclable, each year Americans return only 0.6 percent of the 100 billion plastic bags used. Once plastic bags are in the environment it can take hundreds of years for them to decompose, and they contribute toxins to the soil and water as they do. And paper bags? Although they are more likely to be recycled (about 10%-15%), 14 million trees in 1999 alone were cut down to manufacture the 10 billion paper grocery bags used by Americans. Learning this makes me feel awfully guilty for not doing something as simple as bringing my own bag to the grocery store. Now that I've found a way to really do it in style, I've got no excuse! Plus, carrying my bacon in a bacon bag just sounds right. You can pick up a Bacon & Egg tote for yourself at Archie McPhee for only $6.95 each. This 16-1/2" x 13" x 5-3/4" faux canvas bags will make you look cool while you’re being conscientious. Whew! Just got back from a long weekend which included seeing the 88 BoreDrums (88 drummers, playing together for 88 minutes on 8-08-08), dinner with the parents, the Metal Masters show (Testament, Motorhead, Black Sabbath w/Dio and Judas Preist) and a day of sleeping to recover. The weekend was loads of fun and my excuse as to why I haven't posted at all the last couple of days. Anyhow, there's no shortage of cool skull clothing to be purchased on the internet, but so much of it I can't really swing on my budget. While I can appreciate designer labels and handcrafted quality, there's something to be said for affordable places like Old Navy. I don't think there's ever been a time I've walked into an Old Navy store and couldn't find something with a skull on it. And when they get their Halloween stuff in it's a small smorgasbord for me. Here's the latest Old Navy assortment of skull apparel and it's worth checking the site because there's more. The mens colored skull boxers and the baby skull sleepwear are my favorites. As always, you can click on the pictures to go to the item page. The sneakers aren't cheap and so far they only have women's and children's sizes, but the possibilities are endless. I'm going to create some skull sneakers next. Click on link above it you want to rock my Bacon Sneaker creation or just view if from different angles. Click the banner below to go and create your own. If you do, please leave a comment with a link to your design! Found this pic via Flickr on Lisa...'s photostream and was excited, then puzzled, as I'm sure if there was such a thing as bacon sausage soda or bacon egg soda, I surely would have heard of it before. I am not well traveled and apparently have a lot to learn about food from other countries. The soda in question here is Irish Soda bread and this sign is from a shop in Northern Ireland. A bacon and sausage sandwich, mmmm. It's a lovely menu.